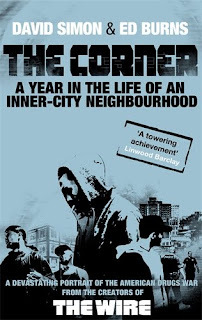 The Corner: A Year In The Life Of An Inner-City Neighborhood is the real-life account of one small area of Baltimore that is home to a continual street market of rival drug peddlars and addicts whose life is reduced to chasing the 'blast' of their next fix. Written by David Simon and Edward Burns, it chronicles the area over a year by the authors interviewing and following the various people who live and deal on the corner drug markets. In particular it charts the story of one family destroyed by the drugs culture and it is at turns, shocking, tender, funny and moving, without ever losing sight of the fact that the tidal of wave of drugs that is flooding the US and beyond needs drastic and well-funded action to help deal with the carnage it is creating. As a piece of journalism it's a truly awe-inspiring book, as a polemic it's never less than convincing and as a work of literature it's superb. Buy it. It's a stunning piece of work.